In addition to this introduction a comprehensive guide to the art and architecture of St Thomas the Apostle Hanwell is available for download in PDF format. And please see our Galleries section for many more images of the church, showing most of the items referenced on this page and in the guide. St Thomas's is a Grade 2* listed building. 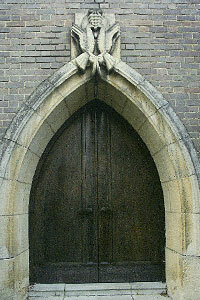 Edward Maufe won the competition for Guildford Cathedral in 1932. 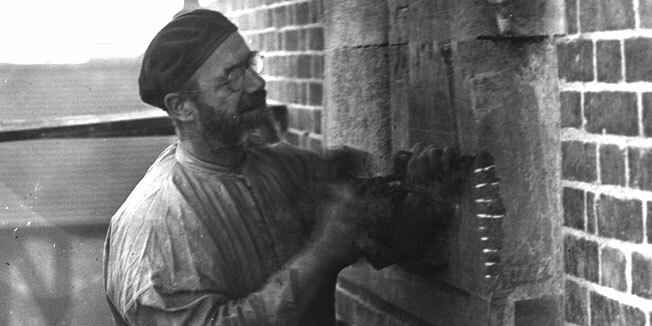 His reputation as a church architect had hitherto rested on restoration work at AIl Saints, Southampton and St Martin's in the Fields; and on two churches for the Royal Association for the Deaf at East Acton and Clapham, and - most notable - a well respected 'Clubland' Methodist chapel in Walworth which was bombed in the war. At the west end of the church is the font, which was also carved by Vernon Hill in Weldon stone. 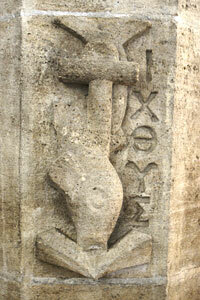 It depicts a fish and anchor and the ICQUS cypher which are all signs for Christ. The stained glass behind the font, depicting 'Christ and the children', is by Moira Forsyth. The War Memorial came from the 'tin church', which used to stand where the Parish Hall now stands. 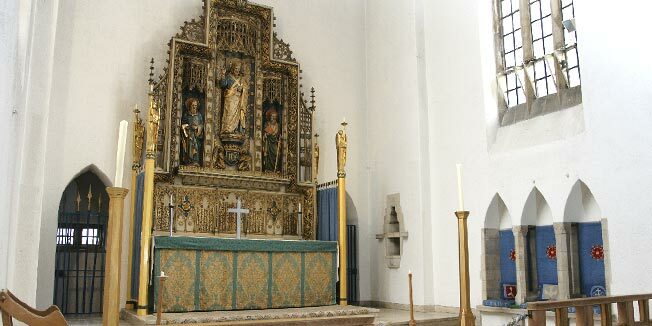 The Sanctuary is dominated by the reredos that came from St Thomas's Portman Square. It was made to the design of Cecil Hare, Bodley's last partner and successor to his practice. The three manual organ also came from St Thomas', Portman Square and was reconditioned and electrified by Walker and Sons Ltd. The timber screens in the chancel are decorated with angels, each playing a different instrument. 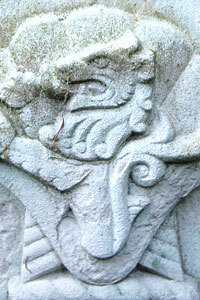 They were carved by James Woodford. 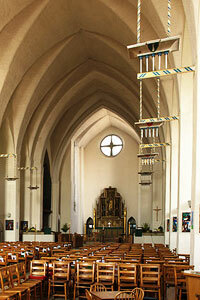 The cross and candlesticks on the altar were designed by Edward Maufe and made by The Artificers Guild. The architect also designed the sanctuary carpet. The floor of the chancel and sanctuary is of travertine marble. 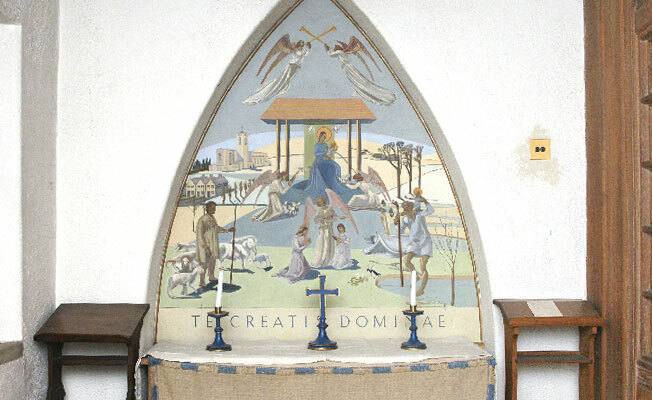 The blue colour used in the reredos is typical of the architect and reproduced throughout the church. Edward Maufe, apparently, did not like purple, which is why the Vestments and hangings used for lent are grey and blue. The Children's Corner (or Chapel) also has glass by Moira Forsyth, and an interesting nativity scene featuring the church, behind the altar, painted by Elizabeth Starling. The wooden carvings over the screen, representing 'flesh, fruit, fish, flower, and fowl' are also by James Woodford. The Morning Chapel (now often called the Lady Chapel) ceiling was painted by Kathleen Roberts. The Madonna and child is in Caen stone carved by Vernon Hill and the cross on the altar and the sanctuary carpet and altar posts were designed by Edward Maufe. Unfortunately, the cross depicted on the right was stolen in May 2004 and we pray for its' safe return. In 1995 the 'acoustic plaster' used, during the original construction, to line the church interior as an insulator and soundproofing material, was found, in fact, to be both blue and white asbestos. 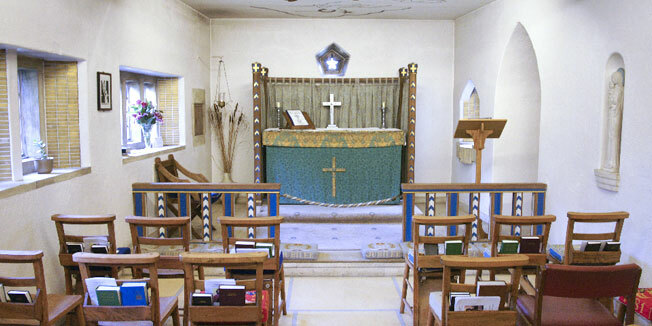 After a prolonged programme of congregation and community fund-raising, supported by the Heritage Memorial Fund and the Diocese of London, the asbestos was removed over a six-month programme in 1999 at a cost of over £330,000. During this time our services continued as normal in the Parish Hall. 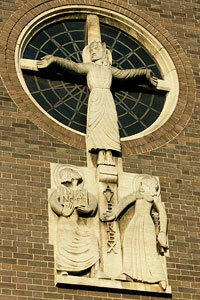 An ongoing programme of restoration works continues to return St Thomas's to the original 1934 decoration. The second phase of the restoration works, which included redecoration, was completed in June 2002 and cost over £50,000. We have now also, thanks be to God and the generosity of both the Heritage Memorial Fund and countless selfless donations been able to complete (September 2004) the replacement of the original copper roof at a cost of over £170,000. Hopefully, as funds permit, the original linoleum floor will be replaced as per the original. Latest estimates put this work at around £50 to 60,000, so we will have to live with the old floor for some time yet! At the same time we can improve the inductive loop which was recently installed. Our next job is to improve 'step free' access to all public areas of the church. It is thanks to the continued support of our local community that all of the works have been achieved, with His guidance. St Thomas's continues to be at the heart of our community and, like a beacon, shows our love for God and His House.